If you are a writer or poet and wish to get published then why not join the self-publishing revolution and get your work out there? There are plenty of options, tips and advice free on the website and there is also a newsletter where Dave sends out handy hints for those wishing to learn more about getting into print every month. Visit south Wales company, Publish & Print and have a look around their website. Set up by Dave in order to help other writers, they offer a low-cost, yet still totally professional service for writers all over the globe! We are UK based and our book publishing services take you from start to finish with no hidden costs. To visit their website – click here. 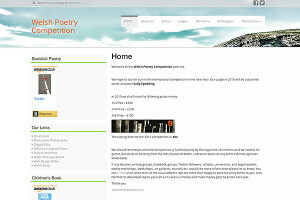 The first international Welsh Poetry Competition was set up by Welsh writer Dave Lewis in 2007. Officially launched on St David’s Day @ Clwb-Y-Bont, Pontypridd, 2007 the aim is to encourage and foster the wealth of creative writing talent that we know exists in Wales but currently languishes in the doldrums. The competition has received entries from as far a field as Abu Dhabi, Australia, Belgium, Canada, China, Corfu, Denmark, England, France, India, Ireland, Italy, Germany, Greece, Hong Kong, Israel, Kenya, Kuwait, New Zealand, Pakistan, Portugal, Scotland, Spain, Swaziland, Taiwan, Thailand, Trinidad & Tobago, USA and Vietnam as well as Wales of course. The competition is totally independent and financed purely by the organisers and does not receive any grants, bursaries or funding from any external agencies whatsoever. With great Welsh writers such as John Evans, Mike Jenkins, Sally Spedding and Eloise Williams judging the competition it is already one of the most well respected in the country. Unlike many poetry competitions there are no filter judges, and so every single poem is read and judged honestly, giving everyone the same chance of success. Dave has also published two fantastic anthologies of the best poems. The first book contains the winning entries from from 2007-2011 and the second book covers the years 2012-2016. To buy either of the books or just find out more click here.